AC710 Mesylate is a potent, selective PDGFR-family kinases inhibitor with Kd values of 0.6 nM/1.0 nM/1.3 nM/1.0 nM for FLT3/KIT/PDGFRα/PDGFRβ respectively. Flumatinib mesylate can reduce the expression of C-MYC, HIF-1 a and VEGF in U266 cell line in a time- and dose-dependent manners, so flumatinib mesylate may become a new drug for MM therapy. CP 673451 is a potent PDGFR-β inhibitor with an IC50 of 1 nM. AC710 is a potent, orally active, and selective platelet-derived growth factor receptor-family kinase inhibitor with potential anticancer activity. Masitinib mesylate is a novel inhibitor for Kit and PDGFRα/β with IC50 of 200 nM and 540 nM/800 nM, weak inhibition to ABL and c-Fms. DCC-2618 is a small molecule inhibitor of c-Kit and PDGFR with IC50s of 6 nM/30 nM/13 nM for c-Kit/PDGFRα/PDGFRβ respectively. Dovitinib is a small-molecule multitargeted receptor tyrosine kinase inhibitor, which inhibits Ba/F3 cells transformed to IL3 independence by ZNF198-FGFR1 or BCR-FGFR1 with IC50 values of 150 nM and 90 nM, respectively. Tivozanib (AV-951) is an oral VEGF receptor tyrosine kinase inhibitor that is designed to inhibit all three VEGF receptors. MP470 is a c-Kit/PDGFR tyrosine kinase inhibitor. AP24534 (Ponatinib) is a potent multi-kinase and pan-BCR-ABL inhibitor. Masitinib (AB1010) is a protein tyrosine kinase inhibitor. S Masson ,etc. Inhibition of Cell Signalling in Neoplastic Canine Mast Cells. , 2014, . Axitinib is a small molecule tyrosine kinase inhibitor,which inhibits multiple targets, including VEGFR-1, VEGFR-2, VEGFR-3, platelet derived growth factor receptor (PDGFR), and cKIT (CD117). Sorafenib (Nexavar) is a novel, small molecular inhibitor of several tyrosine protein kinases (VEGFR and PDGFR) and RAF/MEK/ERK cascade inhibitor with an IC50 of 6, 22, 38 nM for Raf-1, wt BRAF and V599E mutant BRAF. Imatinib (Gleevec) is a number of tyrosine kinase enzymes specific inhibitor. Sunitinib is an oral, small-molecule, multi-targeted receptor tyrosine kinase (RTK) inhibitor for the treatment of renal cell carcinoma (RCC) and imatinib-resistant gastrointestinal stromal tumor (GIST). 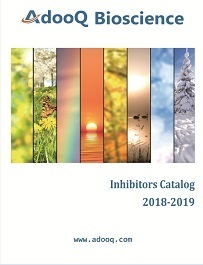 Motesanib, also known as AMG-706, is an orally administered multikinase inhibitor that selectively targets VEGF receptors, platelet-derived growth factor receptors, and Kit receptors. PP121 is a dual inhibitor of receptor tyrosine kinases (RTKs) (IC50 < 0.02 μM for Abl, Src, VEGFR-2 and PDGFR) and PI 3-K family kinases (IC50 < 0.06 μM for p110α, DNA-PK and mTOR). Telatinib (BAY 57-9352) is an orally available, small-molecule inhibitor of vascular endothelial growth factor receptors 2 and 3 (VEGFR-2/-3) and platelet-derived growth factor receptor β tyrosine kinases. Imatinib mesylate, a selective tyrosine kinase inhibitor, induced a sustained objective response in treating gastrointestinal stromal tumors with the inhibition of the KIT signal-transduction pathway. Crenolanib (CP-868596) is an orally bioavailable, selective small molecule inhibitor of the PDGFR tyrosine kinase, inhibiting both PDGFRA and PDGFRB at picomolar concentrations. Flumatinib is a multi-kinase inhibitor with IC50 Values of 1.2 nM, 307.6 nM and 2662 nM for c-Abl, PDGFRbeta and c-Kit respectively.